I finished my first refashion. 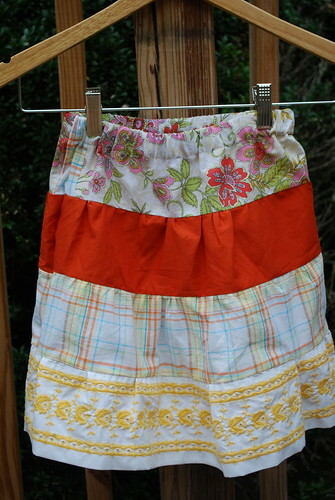 I have been collecting materials and finally had enough to make a skirt for my little girl. My loving and very thoughtful husband took the kids to the park Saturday so I could have a couple of hours of uninterrupted sewing. I cut all the pieces on Friday afternoon. I used instructions I found online (which I now can not find for some reason) and a McCall's pattern to come up with my measurements, so that I had 4 tiers instead of 3. For the top layer (floral) I used a shirt that I found at Goodwill. The orange fabric is a freecycle find. The plaid layer is one of my brother's old shirts. The last layer is from a sheet I found at Goodwill. I even used elastic from an old sports bra for the waistband. Not bad, huh? It was a little tricky since the size of the fabric was limited. As you can see at the very top I had to piece together some of the fabric to make it wide enough. Overall, I am happy with the way it turned out. What do you think? Seriously?!?! That's amazing! The layers compliment each other so well, and I like that little touch of plaid up at the top ;) Totally LOVE how all your material was 'found'. Well done! I'd wear it!!! So cute...great job! WOW, I am seriously amazed at seamstresses...I definitely DO NOT have that skill! I think it is super cute. Dont you love when you can accomplish something like that? It looks like it is so rewarding. No sewing knowledge here! But I like the skirt! Great job and way to be super thrifty! I can't believe how well you did with repurposing even the elastic. It's very cute! Yippeee!!! I am a finalist.